I often explain my radio show’s place in the KAOS world music line up as offering music from the most international cities in our country: New Orleans. And this week’s show provides lots of examples. I’m not alone in my assessment of the city’s international flair. New Orleans is routinely described as the northernmost Caribbean city. I’ve also heard it described as the most African city in the U.S.
New Orleans affinity to the Caribbean dates back to the Haitian revolution in the early 1800’s which generated an influx of French-speaking whites and free people of color into the city along with their slaves. As a southern port, New Orleans experienced daily inbound traffic from all over the world, but particularly the Caribbean and Central America. The New Orleans Cuban connection was fueled twice daily by ferry departures and arrivals from Havana. JFerdinand Joseph LaMothe, Jelly Roll Morton, first coined the term “Spanish Tinge” which he described as an essential ingredient in jazz. Tresillo and habanero rhythms are apparent in the jazz and brass band music of New Orleans, notably second line parade songs. Jelly Roll Morton referred to this as the “Spanish tinge” which can be heard in his “New Orleans Blues.” However, I think he would have been more accurate to have called it the Afro-Cuban Tinge. In Professor Longhair’s “Mardi Gras in New Orleans,” you can hear the Cuban Clave rhythm in his piano playing. Henry Byrd (Longhair) described his style as incorporating rumba, mambo and Calypso. And while its relatively easy to find Caribbean influences in New Orleans rhythm and blues, its not as well known that the cultural exchange went both ways. Fats Domino, Smiley Lewis and other New Orleans R&B artists were routinely played in Jamaican street parties influencing the development of Ska. And the free trade of rhythm continues in the post-Katrina era with an active Brazilian community contributing Samba, Forro’ and other beats to the ever evolving gumbo that is New Orleans music. In this show. you’ll be hearing those rhythms, including Brazilian-New Orleans music. 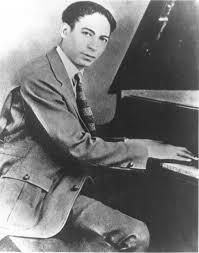 I also will be honoring the anniversary of Jelly Roll Morton’s birthday. (Show originally broadcast live on October 19. 2015.) Listen to the latest show. This entry was posted in Gumbo YaYa Show, New Orleans Performers and tagged Caribbean, Fats Domino, Jelly Roll Morton, Professor Longhair. Bookmark the permalink.